Thanksgiving and holidays are for enjoying family and friends and celebrating, not for spending time over the toilet or in the hospital. Here is some advice to keep you and your loved ones from getting food borne illness this Thanksgiving. Shop early., Not only do you get a wider selection, but you’ll also be able to select the size and portions that you’ll need for the feast. However, if you want a fresh turkey, you want to purchase it within seven days before the day you plan to cook (buy it any earlier and it might go bad). If you want to purchase a frozen one, you should purchase it far enough ahead to allow it to be thawed out properly. Pick a good sized bird. You’ll want about a pound of turkey for each guest. In other words, if 12 people are coming, get at 12 to 14-pound bird. There is no difference between fresh or frozen birds, except for your preference and how you handle the bird you buy (see below). Put the turkey in the fridge. That’s no surprise… but where? The juices from the turkey can drip onto other foods, so the best practice is to put the bird in the bottom of the refrigerator (or freezer, if you’re buying really ahead of time). If you just don’t have the room there, wrap it securely in saran wrap/plastic wrap or put a pan underneath it. Juices dripping from the turkey can make your other foods very dangerous (click here). While it is always best to thaw a turkey in your fridge, there is another way to do it if you’re pressed for time. 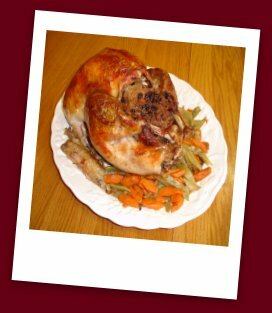 Place the packaged turkey (in the plastic you purchased it in) into a bowl or stock pot that is bigger than the turkey, and fill the pot with COLD water (hot water not only makes the turkey more susceptible to bacterial growth; it also starts the cooking process.) Make sure the turkey is completely submerged in the water; otherwise it may thaw too quickly, which can allow Salmonella to grow. Once filled, turn the faucet down to a trickle and give it about 30 minutes for every pound, not letting it sit for more than three hours. IMPORTANT! DO NOT LET THE TURKEY SIT OUT ON THE COUNTER TO THAW! This allows Salmonella or other bacteria to go crazy! However, once you have thawed the turkey, don’t refreeze it. Thawing it out once again will put the turkey at a greater risk for growing germs. As with all cooking, wash your hands before you start! Remove the turkey from the bag/plastic and wash it in a clean sink. Most turkeys come with giblets and neck packed inside the bird. If you’ve never used them before, check out one of the many recipes online and in cookbooks (when used right, the giblets can really add flavor to your gravy). We just suggest that you remove the giblets and neck from the bird and refrigerate them when you un-package the turkey. After you’ve washed the bird, your recipe may call for you to pat it dry with paper towels. This is especially important if you’re frying the turkey. After you’ve finished washing the bird, make sure to clean the sink! Always remember that every time you handle the RAW bird, you must wash your hands before you touch something else, especially a food you won’t cook or wash again. Wiping your hands on a towel or apron does not remove Salmonella or Campylobacter! 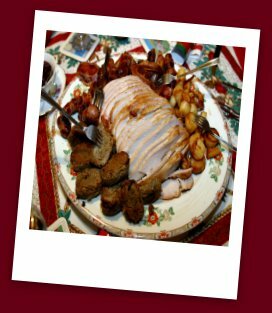 If you are thinking about how to cook your turkey, Chef Kathy is a friend of mine who has a great way to brine a turkey! If you've never tried it, you'll be surprised! Stuffing: If you are going to make a presentation turkey, complete with stuffing inside the cooked turkey cavity, do not cook the stuffing inside the bird as some very old recipes indicate. Instead, make the stuffing separate and then add it to the turkey once the turkey has been fully cooked. Follow the recipe for your turkey, but know that a thermometer is the best way to tell if it’s really done. 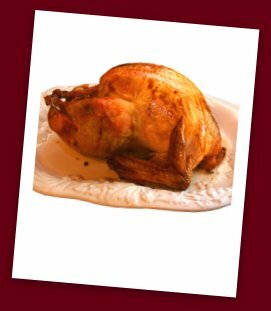 The little pop-up timers are often inaccurate, and if the turkey is not cooked to the right internal temperature, you might be serving doses of live bacteria (like Salmonella) that can make your guests very sick. So when is a Turkey done? Normally, we suggest that you cook all poultry to 165 ˚ F (73.8 ˚ C), but with turkey, we recommend a temperature of 180 ˚ F (82.2 ˚ C). You check a turkey’s internal temperature with a good thermometer. Check the temperatures at the center of the breast, making sure NOT to touch the bone, and in between the leg joint. All ovens are different; just because the recipe calls for a cooking time of four hours (or whatever), that doesn’t mean that it WILL be cooked PROPERLY in that time. Make sure to use a CLEAN knife and cutting board when you cut into the cooked turkey. Using the same knives or board you used when the turkey was raw will allow bacteria to get back on! Oh, and WASH YOUR HANDS! Now the fun part… eating and enjoying. It's best not to leave the turkey, or any other foods, out for longer than two hours. There are different opinions as to whether you can freeze turkey safety, but preventing food from sitting out too long helps keep any bacteria that may have slipped into your food from growing and making you sick when you sample the leftovers. By storing the leftovers right away in the refrigerator, you keep germs from having a chance to grow. The best practice is to cut all the meat off the bones and put it into storage containers or bags. Making smaller bags will let the turkey cool down faster than if you stuff everything into one big bag. Eat the leftovers within a few days. Seven days is the longest they should stay in a refrigerator, but if you freeze portions, they can last for a few months. Knowing how to handle leftovers properly can both keep you and your family safe and help your food budget.